For Timely Frames (or similar) application. Frame features an extended ramp to accomodate additional face of Timely frames (or similar). Ramp has a 3/8�.extension. For new or replacement installations. 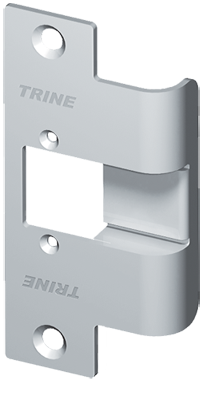 Use with cylindrical locksets and deadlatches having up to 5/8� throw, based on 1/8� door gap. Provides a finished look for wood frames with trim. Faceplate designed for your Timely Frames installation.